NEW DELHI, India (CNN) -- The only surviving suspect accused of taking part in the deadly terror attacks in Mumbai, India, was formally charged Wednesday with attempted murder and damage to public property, a prosecutor said. Prosecutor Ujjwal Nikam (left) holds the case file outside the court. Special Public Prosecutor Ujjwal Nikam told reporters that Mohammed Ajmal Kasab did not attend the court session because of security reasons. 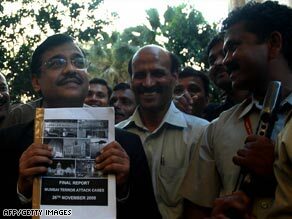 Nikam, speaking outside Qila Court in Mumbai, said Kasab will face other charges. The next hearing is set for March 9. Also charged Wednesday were two men, Fahim Ansari and Sabahuddin Ahmed, accused of helping to plan the terror spree, according to the prosecutor. More than 160 people died in three days of violence that began November 26. Kasab, a 21-year-old Pakistani, was one of 10 men accused of participating in the coordinated attacks on buildings including the Taj Mahal Palace and Tower and Oberoi-Trident hotels, Mumbai's historic Victoria Terminus train station and the Jewish cultural center, Chabad House. The attacks ended with Indian forces killing nine of the terrorists who had caused carnage across Mumbai. The Indian government blamed the attacks on Lashkar-e-Tayyiba -- a Pakistan-based terror group allied with al Qaeda. Nikam said the 11,000-word file that describes the charges against Kasab also contains the names of 35 other suspects being sought in the crimes, many of whom are believed to be members of LeT. The prosecutor said his office hopes to finish the trial for Kasab in three to six months. He has been in police custody since November 28. Also Wednesday, an Indian official said the government has adopted some U.S. anti-terror mechanisms as part of its preparedness against terrorism attacks. Home minister P. Chidambaram told the Indian parliament that India has studied measures the United States took after the September 11, 2001, terror strikes. "We have taken whatever elements are relevant and germane to the Indian situation," he said. He said India is using the U.S. National Counterterrorism Center as a case study in the aftermath of the Mumbai siege. "Notwithstanding some financial constraints, we have tried to replicate the NCTC through our MAC (Multi-Agency Center), which is now the nodal center for counterterrorism. We should spend some more money. But more money has been made available in 2009-10," he remarked.